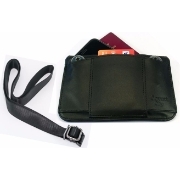 Covert Clip wallets have been created by Andrew: a London City worker, father to two boys, regular commuter on the crowded London Tube and international traveller, who went in search of a theft proof travel wallet that he could wear 24/7. Failing to find one with the features he wanted, Andrew designed the Covert Clip wallet range to meet these needs. Can you see the Covert Clip wallet clipped inside his shorts? Andrew and the team are constantly looking to improve on or design new styles of wallets around the themes of security, convenience and comfort. If you have any features or ideas for a new wallet design, then we'd love to hear from you. I didn&rsquo;t have to worry about anything being lost the whole time and never risked getting pickpocketed as the wallet was safely tucked into my front waste band, making it invisible (and inaccessible) to everyone around me. Genius!